“Advocacy: Justice and the SDGs” is a toolkit is for civil society, activists, and policy practitioners who are working to promote legal empowerment and access to justice. Around the world, billions of people live without the full protection of the law. Legal empowerment reformers can successfully advance access to justice, particularly for the poor and marginalized, but to scale- up their work they need political and financial support. A national justice plan can help achieve this. This toolkit will teach you everything you need to know to enable you to initiate the creation of a national justice plan for your country. It provides a step by step guide to steer you though the entire process: from broadening your understanding of the SDGs and how they can help your advocacy, to how you can hold your government accountable to the justice commitments it has made. This toolkit is a complementary resource to the TAP Network Goal 16 Advocacy Toolkit, which provides civil society and other nongovernmental stakeholders with guidance on how to engage with their governments and other local, regional or international stakeholders to support the planning, implementation, follow-up and accountability of Goal 16 more broadly. 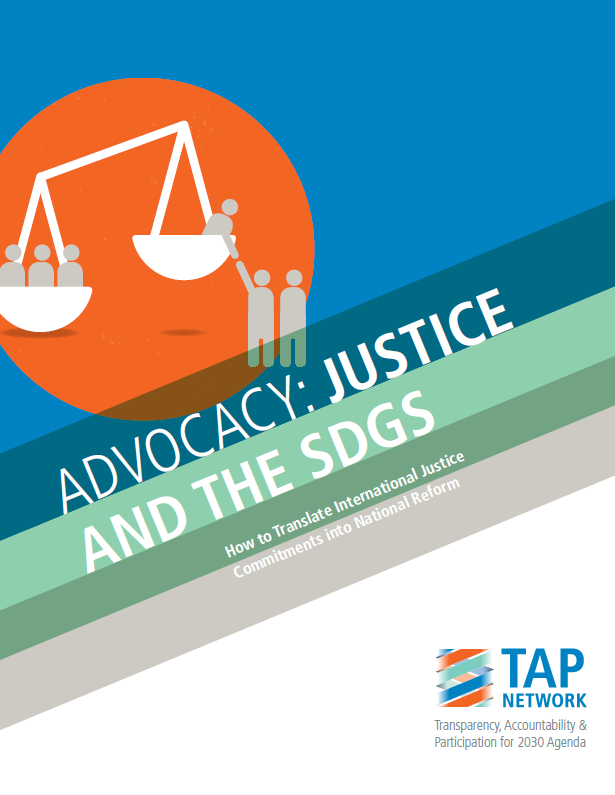 “Advocacy: Justice and the SDGs” was developed by some of the foremost experts on issues of Access to Justice, including Namati, The International Legal Foundation, Open Society Foundations and American Bar Association Rule of Law Initiative.